It's an astute reading of the part and an endearingly fun performance. Yet, it is hard to shake the notion that we are watching a performance of a performance and that this is not Richard so much as Rylance. 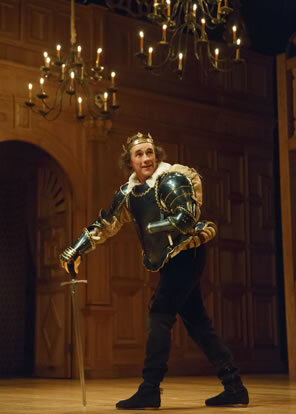 Shakespeare's Globe, Belasco Theatre, New York, N.Y.
Mark Rylance as Richard III. Photo by Joan Marcus, Shakespeare on Broadway. It has become obligatory, unfortunately, for audiences at Broadway plays to applaud when a famous star makes his or her first entrance in the play. 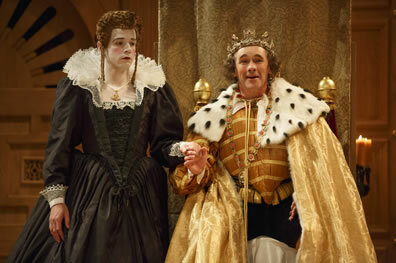 For this production of Richard III, Mark Rylance is the acknowledged star in the title role. So, at the very start of the play, Rylance walks on stage, people clap, and Rylance acknowledges the ovation—but not as Rylance. It's an oh-so-subtle movement, the Duke of Gloucester seeming humbly surprised at the applause, shyly appreciative, and instead of crossing the stage (we sense he's coming from a party somewhere beyond the walls), he detours toward the front of the stage and starts conversing with us: "Now is the winter of our discontent made glorious summer by this son of York," he says, casually, explaining the state of things to us as if we might not know. Right there, this Richard's character arc is established. He is an actor, ever conscious of his audience, whether it is his fellow courtiers, the Londoners, or us, the theater patrons. "Since I cannot prove a lover … I am determined to prove a villain," he says in his opening soliloquy, and it's almost as if Rylance's Richard is explaining himself in an audition. Later, he plays the devil even when he seems a saint, and Buckingham advises him to "play the maid's part" when the mayor and citizens come to solicit him to ascend the throne. After Hastings' beheading, Richard and his followers stage for the mayor a supposed rebellion, with sound effects, stage combat, and fake wounds. It's an astute reading of the part and an endearingly fun performance. Yet, it is hard to shake the notion that we are watching a performance of a performance and that this is not Richard so much as Rylance relying on his stuttering schtick to infuse the part with a playful nervousness. The portrayal holds up until the eve of Bosworth Field, but Richard's soul-baring soliloquy after being visited by the ghosts of those he's killed doesn't resonate with authority. Is this Richard? Is this Rylance? Is this real? Is this an act? Does it matter? It's a conundrum in the specific context of this production, an all-male, original-practice, historically authentic presentation directed by Tim Carroll, first staged in repertoire with Twelfth Night at Shakespeare's Globe in London last year. After a sold-out run in London's West End over the winter, the two plays transferred to Broadway, the first time Tony Award–winning Rylance, once artistic director of Shakespeare's Globe, has played Shakespeare on these shores. With production design by Jenny Tiramani, an oak screen spanning the width of the back stage with two doors on either side of the candelabra centerpiece is meant to resemble a great manor hall or the Inns of Court where Shakespeare's company often played. Stage lighting is provided by real candles, which are lit just before the play begins. The stunning, colorful costumes—from Richard's green armor to Richmond's gold brocade doublet—are not only Elizabethan but authentically constructed with fabrics replicating that of the 1590s. The musicians play authentic instruments in the upper gallery. Before the play starts, the company dresses on stage as the audience enters the theater (get there a half hour before curtain to watch this). We can see that Rylance wears no hump under his bright yellow and gold doublet (with black breeches, he looks like an oversize bumble bee), but we do see the creation of his withered right hand while his halting walk and stooped demeanor evolves as he warms up for the performance. This dedication to Shakespearean authenticity is maintained up to a particular point, and it is a key moment in how this production ultimately plays out: That point is act one, scene three, when Queen Margaret is supposed to enter. Instead, she has been totally excised from this production. This may seem merely a practical decision to trim both play length and cast size, but it actually takes Richard III out of its "authentic" context as the fourth and final installment in Shakespeare's first historical tetralogy. Playing Richard III in isolation does more than allow the removal of a character who was so popular in Shakespeare's time that he added her to this sequel with no historical basis (and hardly any plot basis, frankly); it also influences the way an actor portrays Richard, who first appears in Henry VI, Part Two, and fully develops as a singular character of lore in Part Three. Part Four (i.e., Richard III), continues his character arc, and while he already has taken on the persona of an actor ("Why, I can smile, and murder whiles I smile," he says in Part Three), a deeper psychological portrait has been evolving. Thus, the established Richard starts his own play as a dangerous man—we've seen him kill with unwavering ruthlessness—but no less enchanting to the audience. In contrast, the Richard in the isolation of his eponymous play can start out as Rylance does, with gee-whiz, cute-as-a-bug villainy. It's fun, but hard to take him seriously. It's endearing, but hard to consider him dangerous. This Richard tells us he killed Anne's husband and father-in-law, but it's all so lighthearted that we can't really see it in him (when, in fact, in Part Three he takes part in both with spectacular viciousness). Even after Hastings loses his head in Richard's well-staged temper tantrum, Rylance and company play subsequent scenes more sitcom than sinister. It's a good ride while it lasts, but Rylance, like so many other great Richards before him (Sher and McKellen among those I've seen), loses focus in the final act, and he gives the point where Richard comes face to face with his inner demons in addition to the very real ghosts who haunt his dreams short shrift—and it is there where the truly great Richard resides. The just-crowned Richard III (Mark Rylance) holds court with an obviously drugged Lady Anne (Joseph Timms) by his side in the Shakespeare's Globe production of Richard III, which recently opened on Broadway. Photo by Joan Marcus, Shakespeare on Broadway. Nevertheless, this spirited production manages to maintain its momentum past Richard's missing horse, thanks to the experienced, well-versed ensemble, plus some other not-so-original-practice manipulations of the text. In addition to visiting his dreams, Richard's ghosts here appear during his battle with Richmond (Kurt Egyiawan) and affect the outcome. An obviously drugged Anne appears with Richard when he is king, another addition to Shakespeare's script but a commonly used device to visualize what Richard suggests in this scene (and Rylance treats Anne, played by Joseph Timms, as a ventriloquist doll). One brilliant stroke of staging in the council scene leaves the audience agape. After Richard has requested the Bishop of Ely (Matt Harrington) to fetch him strawberries from his garden, he and Buckingham maneuver Hasting's condemnation. Richard first reveals his withered hand, and as we are about to see Hastings (Paul Chahidi) beheaded right there on stage, Richard is handed a bowl that, we think, will be used to catch the head. Richard looks down at the bowl and stops; it seems he has had a sudden change of heart. But no, he picks out a strawberry from the bowl and eats it, then hands the bowl to Ratcliff and orders "the rest that love me, rise and follow me." The post-intermission second half opens with Buckingham (Angus Wright) eating strawberries, and as Richard enters in full royal regalia, he offers Buckingham his withered hand to kiss. Richard wipes the cheeks of the drugged Anne and spreads her tears on his eyes before saying, "Tear-falling pity dwells not in this eye." He then uses the ring he gave Anne in their courtship scene as the token for Tyrrell (Chahidi) to gain access to the Tower where he will kill the young princes. Later, in his courting Queen Elizabeth for her daughter's hand in marriage, Elizabeth (Samuel Barnett in a riveting performance) slyly discombobulates Richard and ends the scene kissing him. It might be real attraction, it might be survival instinct, but it is probably the one way she knows to get him off his part: proving him to be a lover rather than a villain. Such details and such nuanced ensemble performances, more than the production's pretense at authenticity and the star power of the main character, are what make this Richard III special. It may not be truly original practice, but it is truly original in its own right.